Makindye is a a middle class residential area with some beautiful views of Murchison Bay, part of Lake Victoria. The area has mostly dirt roads, and feels a bit removed from the city with things more spread out. As you near Makindye roundabout the area gets a bit dodgy, it’s not that safe. There are a few local clubs and it can be a bit noisy in the nightlife areas. One of the selling points for Makindye is the beautiful views. In Makindye you can find multi-bedroom apartments with balconies, for less than $300, a month. It’s a good place to find a budget apartment, complete with tiny kitchens and iffy power. One of the positives is the location, it’s not so far from town. Makindye House – Fully furnished rooms available for rent in a beautiful guest house in Makindye, rent includes laundry services. Rooms range form $7-$10 per night and $200-$325 per month. ARA – American Recreation Association Kampala: This facility has only 12 rooms available but it is a great deal. You get full access to a plethora of above listed facilities and a continental breakfast for only $60-$75 per night for single and double rooms and $90-$105 for suites. Third Saturday of every month they do a rummage sale. Tandem Hotel – Cute outdoor cafe with small decorative waterfalls. Tour vehicles available if you would like to schedule a trip. Small restaurant with local, Indian and Chinese cuisine. There isn’t much shopping in Makindye but Kattyz Boutique is my favorite small roadside clothing vendor. Mark Supermarket – General supermarket. Kattyz Boutique – This isn’t your average side-of-the-road vendor. It’s a small clothing boutique that sells used and new clothes. You’re probably just as likely to walk away empty handed as you are with an amazing treasure. I found a super cool vintage Dolce and Gabanna men’s shirt with the original tags still attached! What! The ARA is a highlight of recreation in Makindye, it definitely appeals to expats on a budget. If you need to e-mail home, catch a game or hang out at the pool, this is the place for you! ARA – American Recreation Association Kampala: A popular family club with facilities including: gym, sauna, adult and children’s swimming pools, 2 tennis courts, children’s play ground, squash courts, volleyball, basketball, business facilities, wifi, dvd library, and a bar and restaurant. Annual memberships range from $400 for singles to $620 for families. You can also enjoy the facilities for the day for just $5. Lake Victoria – fishing, canoes, boats and sailboats. 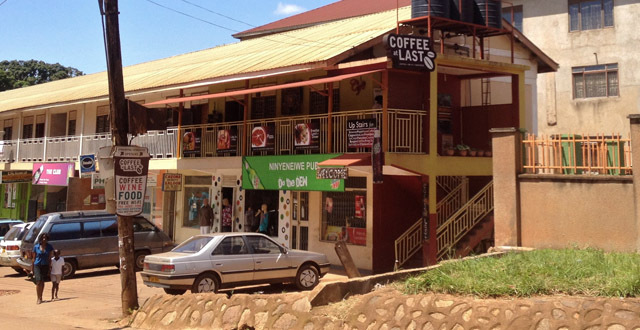 Coffee at Last is the shining star in Makindye. It’s small and cute and the perfect place to spend the afternoon. It’s located on the second level of a small shopping strip and has a peaceful, green environment. Coffee at Last – Excellent coffee, sandwiches, pizza, lasagna and wine in a cozy atmosphere. They’re famous for their amazing brownies and really great service. We always recommend The Surgery for healthcare needs but if you’re in a pinch Makindye General Hospital is the closest option!